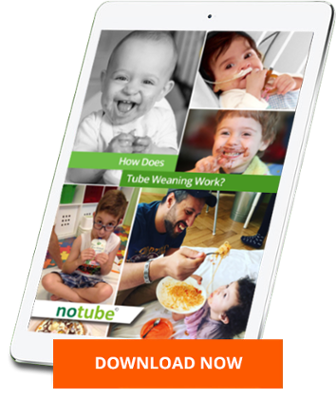 In the meantime I had been searching for a “solution to the feeding tube” and found NoTube. I read all the information on everything from the Graz Model to Netcoaching and was relieved that tube-weaning was possible in our own hospital. When Viktoria was discharged from hospital in March 2015, the health insurer had already agreed to cover the costs and we could start the tube-wean. An unsettling but happy time followed. Viktoria was now 22 months old and had never had contact with food and drink. That soon changed and she started to drink water first and then light fruit juices. She tried nearly everything that she was offered and was allowed to mess with everything, which she did extensively. It didn’t matter what it looked like around her as she couldn’t swallow everything that she chewed. Every little improvement was a great experience. After just three weeks the feeding tube could be removed and Viktoria removed it herself. She now developed a feeling of hunger and demonstrated it clearly; wanting to be served immediately. She made great developmental progress. I felt well cared for by the NoTube team the whole time; regardless of what I did or which questions I asked, they were all answered. Above all the praise during the tube-wean did me good and I felt understood and appreciated. I can’t describe it in words, but everyone is happy with the result and to this day Viktoria can feed herself. The doctors and nurses in the hospital have followed the whole process and are happy for Viktoria. Many thanks to the whole team from NoTube for their sympathetic care and support.